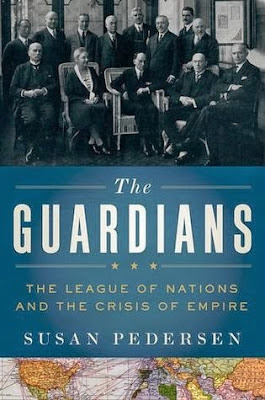 The League of Nations, the precursor to the United Nations, was an intergovernmental organisation created as a result of the Paris Peace Conference that ended the First World War. Its principle mission, at which it failed, was to maintain world peace. But it also had another important, but little known, function: it established and oversaw the mandate system. At the end of World War I, the victorious allied powers wanted to annex the Ottoman territories and German colonies they had occupied. Woodrow Wilson, and anti-imperialist activists, disagreed. The Americans, supported by the British, proposed instead to let the allied powers hold and administer these territories, which included countries in the Middle East, African, and The Pacific, under “mandate” from the League of Nations. Mandated territories weren’t colonies. At least, they weren’t supposed to be. The mandate system clearly stated that Western countries were supposed to help “backwards” people become civilised enough to be able to govern themselves. Then, they were supposed to leave. But only Iraq was given independence this way, and only with great reservations. The League Of Nation had a very paternalistic and racist attitude towards the populations that lived in mandated territories. Its members believed that these people were too uncivilized, uneducated, and backwards to govern themselves and that they would need the help of the civilized western countries for decades to come. Because of that, they often didn’t pay much attention to the protests and grievances these people had against their “protectors”. These suited the allied powers very well. They were able to exploit the natives, and then repress with force their protests, claiming it was the only way to deal with “those uncivilised people”. The treatment South West African and Belgium’s mandated territories received was particularly appalling. They drew the censure of The League Of Nations, but its members were unable to take practical steps to help those populations. Also interesting is the section on Palestine. It highlights the eagerness of Germany, Poland, and other central European countries to create a Jewish state to deal with the “Jewish problem”. Germany wasn’t the only anti-Semitic country in the ’30s. This is just the tip of the iceberg. Although academic and at times dry, Pedersen’s analysis of the mandate system is also fascinating and insightful. Her study shows us how the League Of Nations helped created a new kind of imperialism. One in which Western hegemony is secured thorough economic concessions. It also helps us better understand how the misdeed of our imperialistic ancestors have shaped the world in which we live today and created problems that are far from solved. If that’s something you’d like to know more about, I highly recommend you pick up a copy of this book. Although academic and at times dry, Pedersen’s analysis of the mandate system is also fascinating and insightful. It helps us better understand how the misdeed of our imperialistic ancestors have shaped the world in which we live today and created problems that are far from solved.